Folks who do a whole lot of gaming would know that audio is extremely important in the enjoyment of a particular title. After all, this is no longer the 1980s or early 1990s where ordinary games can still pass by with simple beeps and boops without taking too much away from the overall enjoyment. Special sound effects add a whole new dimension to gameplay, where you would feel totally immersed in the game, not to mention helping you discover just where your opponent is in a one-on-one first person shooter deathmatch. The thing is, not every one of us have the luxury of staying alone or have the means to build a dedicated gaming room, as we have to share our living space with other humans. Sometimes, our gaming times clashes with their sleeping pattern, so you are unable to crank up the volume to your preferred level, if at all. This is where a pair of headphones come in handy, and the PlayStation Gold Wireless Stereo Headset does seem to be a decent fit. The new PlayStation Gold Wireless Stereo Headset will be able to deliver 7.1 virtual surround sound, custom audio modes that have been created by developers specially for PlayStation games, a hidden noise cancelling microphone that will be able to handle all of your voice chat needs as you play online, and customizable faceplates, among other features. The asking price ain’t too shabby either, as you will have to fork out a relatively affordable $99.99. 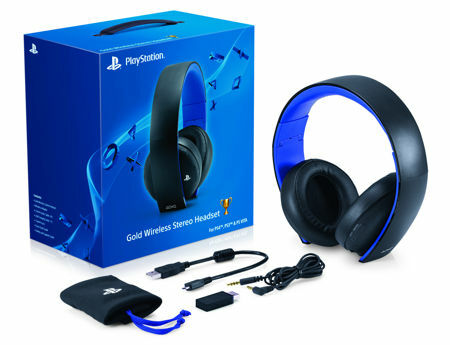 The PlayStation Gold Wireless Stereo Headset is rather versatile in the sense where you can hook it up to your PS4, PS3 or computer using the wireless adaptor, where its internal battery is able to go for up to 8 hours of non-stop gameplay before it requires a recharge. Not only that, this particular headset will play nice with your PS Vita or other mobile device thanks to the included 3.5mm audio cable. Sporting a portable, folding design as well as travel pouch, it will be ideal for playing games or listening to music at home or on the move.